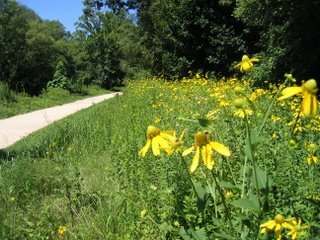 The photos here are from mid-August of this year, when cutleaf coneflower was in full bloom along the towpath near Harrison Street. In previous years, all of these plants were getting mowed down before they had a chance to bloom. 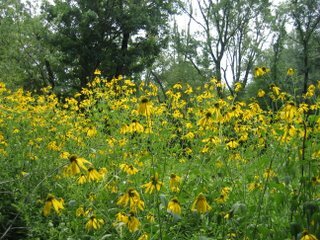 The good thing about the mowing was that it kept trees from encroaching, and was not so frequent as to wipe out the wildflowers altogether. Now, the mowing will only be done once a year, in early spring, so tree seedlings will still be discouraged but the coneflowers and other wildflowers will have a chance to bloom.